Winter is coming! We can hear those sleigh bells jingling (ring ting ting… What? Too soon?). That must mean cottage season is all over and millions of Canadians are bidding farewell to the great outdoors to hibernate until April. Wait a second! There’s plenty for the outdoorsy to do during the cold winter months. Just ask the folks over at Skyline. The developer’s new northerly condo project, Horseshoe Copeland House, is offering a resort condo experience that works just as well in the winter as it does in the summer. Condos at Horseshoe start at only $199,900. The resort itself features five restaurants, 2 championship golf courses (they’re probably better in the summer), 25 ski runs, an Adventure Park and 67.5 kilometres of Nordic trails. What makes this even better is it’s all only an hour away from Toronto and 15 minutes away from all the shopping and dining options that Barrie has to offer. And to top it all off, buyers can participate in the hassle-free rental program that lets you rent out your resort condo while you’re not using it. All this winter-talk is making us want to go for a walk in the snow, but only if the landscape is as serene as the one in the Horseshoe Copeland House rendering. 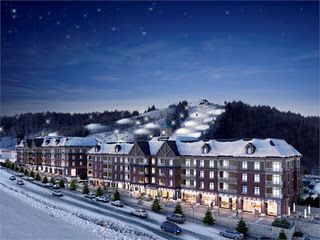 Email jen@horseshoevillage.com for more info or click on over to the project’s website.